Without getting too deep into Italian wine law, it's important to note that there exist several regions within Chianti, and the one we are discussing here, Chianti Classico, is one of the most significant. 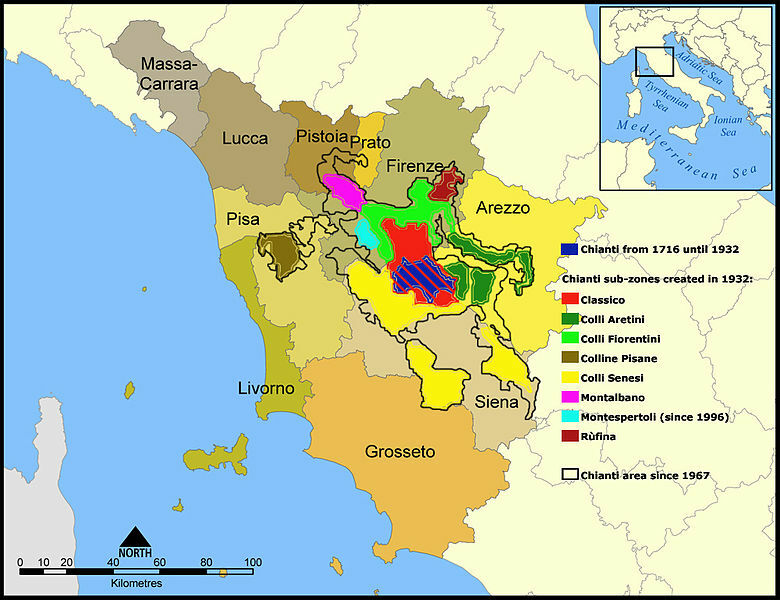 Within Chianti Classico lie the historical boundaries of the region, as originally laid out in the mid 1800's. Right now, there are several grape varieties allowed in the production of Chianti (and Classico) wines. Sangiovese is the dominant, as you probably already knew. In fact, it only recently became legal to produce a Chianti with 100% Sangiovese. Since 1996, the blend for Chianti and Chianti Classico has been 75-100% Sangiovese, up to 10% Canaiolo, and up to 20% of any other approved red grape variety such as Cabernet Sauvignon, Merlot, or Syrah. White grapes are currently banned for use in Chianti wines. Touching on the aging and alcohol regulations for a moment, Chianti Classico must have a minimum alcohol level of at least 12% with a minimum of 7 months aging in oak, while Chianti Classico's labeled Riserva must be aged at least 27 months at the winery, with a minimum alcohol level of at least 12.5%. Ironically the quality control issue reared its head with regard to the samples of Chianti Classico I received. Out of maybe 9 bottles, two were badly corked, two had serious Brettanomyces contamination, and one smelled of nail polish remover. Those of course did not get reviewed, but it's clear still more work is needed in the cellars. 2008 Volpaia "Coltassala" Chianti Classico: Warm oak tones dominate the nose at first, overshadowing more subtle aromas of red fruit, herbs, and red earth. On the palate, medium acid and soft tannin work nicely with tart red cherry and plum skin, dried herb, and a finish of smokey game meat. The acidity really shows through on the finish too, where it creates a nice drying effect, readying the palate for another bite of food. *Highly Recommended* 13.5% abv. $50. 2010 Felsina "Berardenga" Chianti Classico: Oak and soft black cherry notes jumped out at me right away. I also picked up red Jolly Rancher and pepper notes. This, just by the smell, seemed like a very young wine. It's dry and soft on the palate, with plenty of tannin that partially obscures tart red fruit, peppery spice, cinnamon, and soil flavors. I suspect this is a wine to either decant now or just wait a few years on. Great acidity should hold everything together for several more years. 13.5% abv. $18. 2008 La Porta di Vertine Chianti Classico Riserva: Shows some brett in the form of smoked meat and band-aid, also some dark fruit - think black cherry and plum. Out of the four I opened, this had the most black fruit compared to the redder orientation of the previous wines. It's also got some considerable oak influence from the mocha notes I picked out too. Nice drying tannin but a curious lack of acidity left me somewhat confused. There isn't much on the palate beyond bitter grape stem and more mocha notes. Somewhat disappointing. 14.5% abv. $50. The above wines are not cheap, save for the Felsina, which is very reasonably priced for the quality. The more I thought about these wines, the more I concluded that they are not QPR winners by any means, but that a couple of them were quite good and the 2008 Volpaia was excellent. Still, as a wine lover and someone who spends a significant portion of his income on wine, I still cannot say I would buy Chianti Classico over a Brunello di Montalcino or Barbaresco. On the other hand, if you are smitten with Italian wines, these could be very reasonable prices to get wines which are, according to the law, higher in quality. These wines were media samples. Some of those wines are familiar for me. I hope that I'll try the others too. They should be delicious, according to this description.